Why Does Silver Jewelry Tarnish? As many metals do, sterling silver tarnishes over time. The purer the silver the more it will tarnish. Sterling Silver is made up of 92.5% silver and 7.5% other metals, mainly copper. Thus Sterling Silver is referred to as 925 Sterling Silver or 925 Silver. Most 925 Silver will be stamped with a S925 or 925 mark, however not all pieces, especially fine jewelry pieces allow for this. We also use fine silver and find it does tarnish faster but can be quickly polished with a soft cloth. 14 karat gold is comprised of 58.3% gold. 18 karat gold is comprised of 75% gold. 18k gold is more expensive and more vivid than 14k gold, but it is more prone to tarnishing (as it is softer). White gold is a mix of gold and at least one white metal – probably nickel, manganese or palladium. The gold is then plated with an element called rhodium. The silver hue of a white gold engagement rings comes from the hard rhodium-plating. Nickel allergies are common so beware. 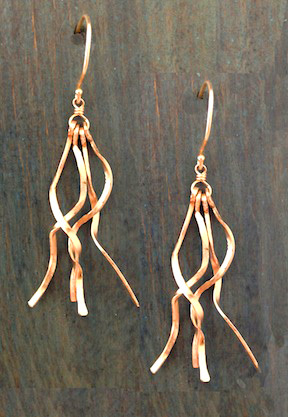 Rose Gold is very popular, an example of more copper added to the mix. It is not advisable for people who are allergic to copper. Platinum is usually 95% pure platinum mixed with various alloys. It is heavier than gold, harder and more expensive. Not to be confused with base metal and cheap gold plating - our gold vermeil charms are all fine quality. Vermeil (pronounced ver-may) is a combination of precious metals. The inside core is pure sterling silver. The outer coating is real gold. Our small spiritual charms are 24k yellow gold color with 40 microns of 98.5% pure gold plated over sterling silver with a fine layer of nickel in between. The plating process uses 98.5% pure gold. It is a gem quality plating 40 microns thick over sterling silver or bronze with a fine layer of nickel in between. The plate is very reliable and extremely popular with our customers. 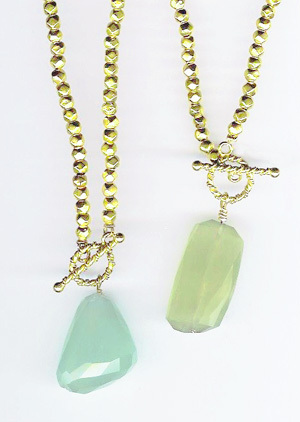 Our wire wrapped chains are also vermeil but they are not as thick a coating so you must treat them carefully. Metal oxidizes and can crack so we recommend treating it gently and keeping it dry. Store our chains and all vermeil and silver jewelry in an airtight plastic bag for maximum life. 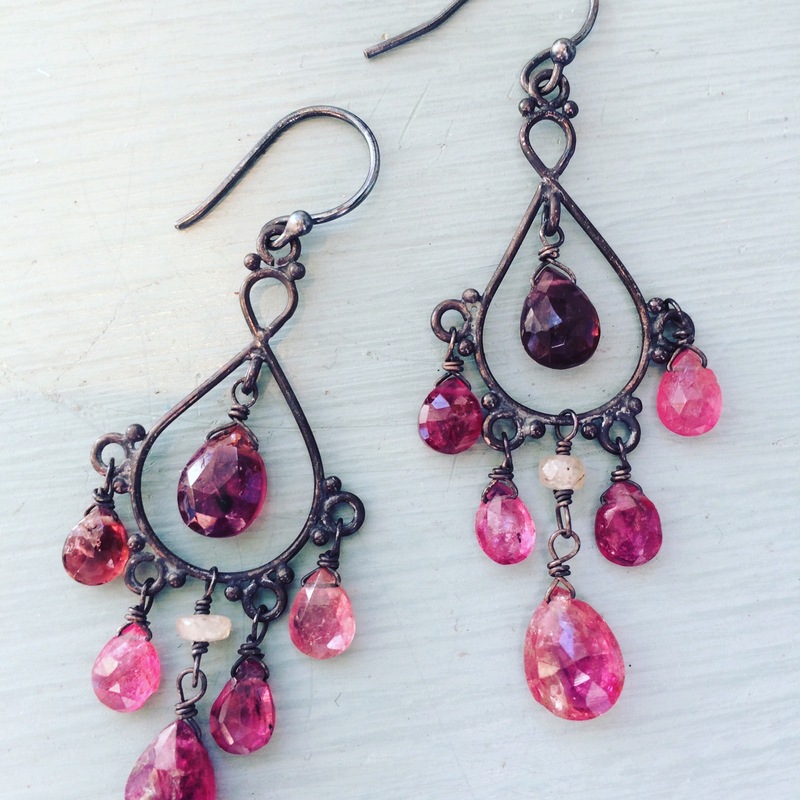 Birthstones are a wonderful jewelry idea. 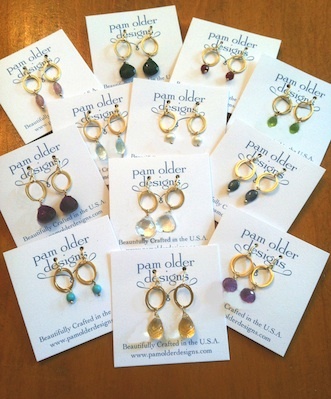 In our shop at Pam Older Designs we always have a pretty birthstone necklaces, birthstone rings and earring at the ready! Email us at Pamolder@mac.com to request pictures! 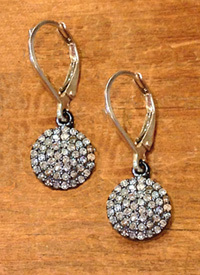 A briolette is faceted bead usually pear shaped, teardrop shaped or heart shaped. We use briolettes in most of our designs. A cabochon is a highly polished, convex unfaceted gem with a smooth surface. 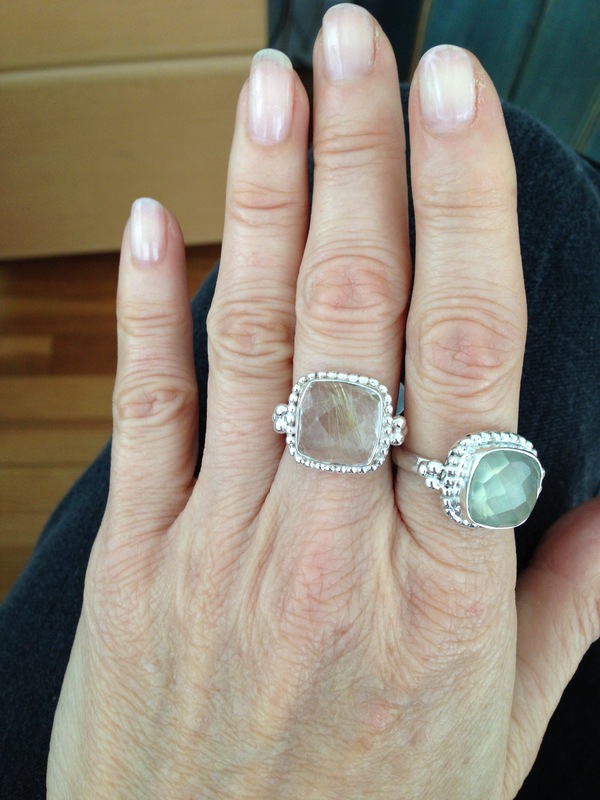 Moonstone, sapphire, tourmaline, coral and other stones look beautiful in a cabachon cut. Ask about handcrafted custom rings that we can make for you with your own stones! 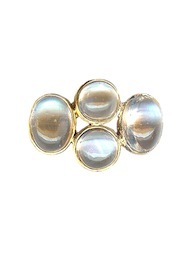 Our beautiful moonstone ring below is made from smooth cabochons. Diamonds and gemstones are sized by carat weight. One carat is equal to 200 milligrams. In pieces with multiple diamonds, the total carat weight (tw) is often listed. The weight of smaller diamonds is often expressed as points. A point(s) is a scale of weight that is equal to .01 carat. For example, a one carat diamond is made up of 100 points. At Pam Older Designs many of our pieces start out as wax models that we make into molds, that then get cast in silver and gold. An example of this technique is shown below. The small beads surrounding the stone are called granulation. These rings below are handcrafted and shown in prenite and rutilated quartz. A toggle is a decorative clasp consisting of a ring at one end and a short bar on the other. The bar passes through the ring to sit across it, securely fastening the two ends together. Hammering metal is another technique that we like use in our studio. We use wire and a hammer to shape pieces into a design. We add texture using various size hammers and other stamping tools. We love to use wrapping techniques. 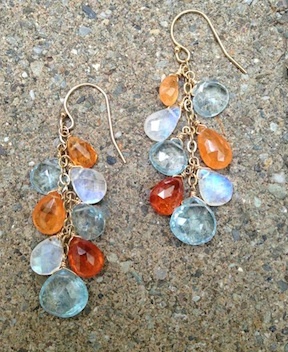 The moonstone and blue topaz earrings shown below are wire wrapped to chain to form a lovely dangle earring and a burst of color on your ears! The unusual orange stone is called Manderian Garnet. The French term used to describe a stone setting technique where tiny diamonds, rhinestones or gemstones are set very closely together within the base. Pronounced pah-vey, it looks as if the surface is paved with stones, a mosaic of gems or diamonds. This look has become quite modern and popular. Pave comes from the French word for paved. Stones, usually diamonds are set around 1millimeter apart. Small beads or prongs of precious metal hold the diamonds in the setting.